Yay, my Transdesign order shipped today! I can't wait to get those OPI glitters! Anyway, I ended up buying the new Diamond Cosmetics collection for Fall. I mean, they are so cheap at $2.25 so I couldn't resist (and I don't feel bad about buying them!). Under the Willow Tree is so dark. In certain lights it looks black, but it is really a dark teal green creme. My apologies for not being able to truly capture the color of this one because it really doesn't look as black as it does here. While I do like the color, I wish it were a smidge lighter, but that's just a personal preference. I can totally see people loving this dark vampy polish. It was also really pigmented and only needed 2 coats. Perhaps if you have a really light hand in applying this you could see the green a bit more. The application was just fine on this one as well. What do you think, is Under the Willow Tree too dark for you? It's Glee time and I'm blogging! You may remember me posting about Lady Gaga on the cover of Vanity Fair wearing Deborah Lippmann's Waking Up in Vegas. I was able to get my hands on it, so here it is! It is a grey/taupe creme that seems to be the "it" color for Fall. That's probably the #1 question I get asked in real life when people find out that I am a nail blogger. "Hey Audrey, what are the new _____ (insert season) trends?" Well my friends, I think it is the greyed out taupes for fall! I don't mind one bit at all because I love how they look on my nails and they looked bangin on Lady Gaga! This one applied flawlessly, seriously. It was almost opaque in 1 coat, but I just always use 2 so that's what you see here. In case you've forgotten, when I reach 300 followers I will be having an international giveaway featuring Deborah Lippmann's Across the Universe and Bad Romance! Don't forget to tell your friends! Happy Monday, everyone. Can you believe September is almost over? We got 3rd place at trivia tonight! Hooray! It's about time we are decent. I've finally gotten around to buying several from the Essie Resort Collection and I have to say I'm not disappointed! I'm always a huge fan of the color turquoise and turquoise jewelry so this one is right up my alley. Turquoise and Caicos is green/blue creme that is just gorgeous. The application is a bit annoying though. It was a little streaky and needed 3 coats overall. It started to pool a bit because I didn't apply it thin enough (I also got those tiny little bubbles under the polish...I hate that). I love the color, but hated the application. 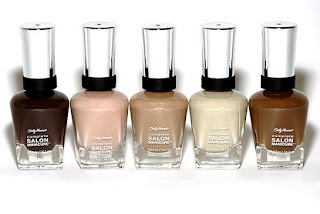 You may have seen the new Sally Hansen Xtreme Wear polishes at your local drugstore. I was lucky enough to find a few of these at my local Ulta recently. I love that these polishes are very affordable, easy to find, and really wear well. Today I have Cherry Punch which is a red polish with small holographic hexagonal glitter with bar glitter thrown in there for good measure. Unfortunately this one just didn't work for me. There is just something about the red base that just didn't work with the glitter. Also, some of the bar glitter got lost in the base. I love the concept, but not the execution. I have another polish from the collection that has the same glitter with a different color base, so hopefully I will enjoy that more. Application was just fine, but you need to watch the bar glitter near the end of the nail so that it doesn't go over the free edge and stab you (I had a problem with it poking me from one nail). Just to let everyone know, the OPI Burlesque Collection is now available for $5.25 on Transdesign (http://www.transdesign.com). Happy Shopping! So it's official, the science video I made back in May is now published online! I'm not going to post the link, but if you're dying to know (or you're a huge microbiology/virology geek) feel free to e-mail me and I can send it to you. I've been trying to deal with a program called Endnote which is supposed to help you organize your citations in papers. Usually I don't have a problem with it, but now that I'm dealing with a huge document (i.e. my dissertation) it's giving me a headache. Oh well. Tonight I treated myself to Ulta since I had a $3.50 off any $10 coupon to use. I found the Revlon satin polishes and I bought the white one so stay tuned for that. I also got color matched to the new MAC Pro Longwear SPF10 foundation. Apparently in that foundation I am a NC25 and not a NC20. Who knew? In other polish news, the OPI collection Burlesque is going to be on sale tomorrow at Transdesign. Glittermania here I come! Ok, on to the polish for today which is L'Espirit by American Apparel. Yeah, this one looks like Easter in a bottle (that's what my husband tells me when I wear pastel polishes), but I love pastels so I'll wear them when I feel like it :-D It's a lavender purple creme that seems to have a hint of blue in it. I must admit, these polishes pretty much apply themselves. Ok, that's it for the American Apparel polishes. Overall, I think these polishes are full of win and if you're near a store (or are ballsy enough to order them online (I hear they don't pack the polishes very well)) definitely pick a few of these up! There are just too many things to watch on tv tonight! Why do all shows have to be on Thursday?! Seriously, our DVR is going to be working hard tonight. I feel like I haven't had enough polish talk at the beginning of my posts. I have been really stressed working on my dissertation and I have a defense date set in November! Aaahhhh!!! Oh, I do have a little polish news. I was contacted by a new company today that is just starting out and is making polish. I don't know more than that, but they seemed very interested in bloggers and finding out how to work with us which is a change...a good change! Up today we have Mount Royal from American Apparel. It is a deep blue creme that has a hint of purple in it. I don't really consider it a blurple by any means, but it has a little purple in it. It applied so smoothly and was so pigmented in 2 coats. Again, this one was also very slightly thick, but nothing too troubling. I am loving these polishes so far! While in Seattle a few weeks ago I had an American Apparel on the same block as my hotel. So the day I arrived I had to scope out the polishes, right? They had some really nice colors and they were $6 each or 3 for $15 so I, of course, bought 3. I really like the bottle shape (they remind me of the old Massini bottles) since they are the skinny square ones. I'm going to start out the reviews by saying that I really do like their polishes, but I do not condone the practices of their owner (based on their ads, his attitude toward employees, etc.). Ok, that's all I'm going to say about that. On with the review! Up first is Butter which is aptly named because it looks (and applies!) like butter! It is a pale yellow creme that actually goes fine with my skintone. The formula on this one is fairly thick, but in a good way, I swear! Just make sure to use thin coats and you'll have no problem. For a yellow polish, I had no problem with streaking or anything like that. This is seriously the second time I've had a yellow polish apply well (the other one is from Jessica Cosmetics). Also, it is really opaque and only needed 2 coats. Glee is back on tonight! Who watched it? I just finished it! This is the last polish I have from the Milani Haute Value polish collection. While I was getting Dress Maker I figured, why not get 2? I know, I just can't help myself! You know I love cornflower blue polishes and I love shimmers, so why don't I absolutely love Tailor Made? Well, it is really sheer. This was three generous coats and it still has bald spots. Grrr. The application was similar to Dress Maker and was watery. Also, you really need to be careful of brush strokes with this one. Overall, I love the color and the shimmer finish, but the application and formula have some issues. Again, I found these at CVS and I believe they were $4.99 each (please correct me if I'm wrong). So we lost at trivia again. Blarg. I think I should just stop mentioning our losing and start letting you guys assume it. I'm a big fan of dupes...when they are dupes of really really expensive and hard to find Chanel polishes like Milani Dress Maker is. It is a dupe for the polish Jade which is a mint green polish with green shimmer. Is this a better dupe than Dream Catcher from Claire's or the Charlotte Russe dupe? I have no idea because I don't own Chanel's Jade (nor will I ever likely own it). While I love mint greens, I'm eventually going to get burnt out on them. Until then, lets just enjoy this while we can. Now the application leaves much to be desired because it is really sheer and watery. This is a very thick three coats and it just finally covered the nail line. I found this at a 24 hour CVS but it took me a few to finally find it. What do you guys think? Love it or are you getting sick of mints? So this is the last polish I have of the new Tracy Reese for Sally Hansen Fall 2010 collection. Someone on MUA mentioned yesterday that she found the whole collection at Meijer the other day. I'm so jealous because I used to have a Meijer nearby :-( If you are in the tri-state area with a Mejier, make sure to stop by and check to see if they have it. I wasn't sure how many polishes were in the collection, but there are lots more than what I have here! Yay! I've been trying to stop buying nail polish until OPI comes out with their holiday Burlesque collection (yikes, I hope OPI doesn't come after my little blog for even mentioning their new collection). I'm looking forward to the glitters, but I'm not sure about the other ones. Hopefully some other blogs will show some swatches before they come out on Transdesign. Ok, today is the last of the Tracy Reese polishes and it's called Wet Clay. The name is actually really appropriate for the polish because it totally looks like wet clay (well, not what we see in Tennessee because that is red clay...very different). This is probably my least favorite of the polishes, just because it's a little too close to my skin color. I don't necessarily dislike it though. Some people really want to find their mannequin hand polish, and if that's you, you may want to check this one out. Overall, I'm happy with these, especially because neutrals are really in right now. I hope to find the rest of the collection at Walgreens, Rite-Aid, or CVS soon. If I see it, I'll have to try and take a picture of it for you guys! Happy Friday everyone! Sorry for the late post, but I was out to dinner and a movie with my husband tonight. We had some great Mexican food followed by Easy A with Emma Stone. I really liked the movie! There's something about Emma Stone that makes her so likeable! I'm not going to lie, before the movie started I felt bad about having to post late tonight. I just don't want to disappoint you guys! Since you had to wait on me, I am going to post my favorite polish of the collection which is called Fedora. YES! A neutral beige polish with gold shimmer! The shimmer isn't too noticeable, but it does make a nice texture and depth to the polish. Overall, if you're going to buy any from the collection, this is my pick. Don't forget, this collection comes out this month so keep your eyes peeled at your local drugstore. As always, the application and formula were flawless. What do you think, is this your favorite so far? I'm sitting here watching a rerun of Tosh.0. Does anyone else think this is the funniest show on right now (well, It's Always Sunny in Philadelphia is coming back tonight so it's going to give it a run for its money!)? I love that so many shows are coming back in the next few weeks. Unfortunately I need to continue writing or I'd sit and watch tv all day! Yesterday we had the lightest polish of the collection and now we're going to the darkest which is called Bittersweet. Oh yes, dark chocolate colored polish at its finest. It looks like you took a bag full of dark chocolate chips and melted it down in a microwave and you're left with smooth chocolate (and yes, I'm too lazy to use the whole double boiler technique for chocolate...so sue me). As you can see it looks a little darker on the nail after it's dried which is fine because it is never so dark that it looks black. I really like this one and I think it would look good on lots of skintones. The application and formula was just fantastic, but as always, be careful of the brush on these. For 3.1 Phillip Lim, Angi Wingle created a city slick nail by layering Copper Shimmer over Asphalt for a gorgeous, reflective urban nail with attitude. At Gottex, Wanda Ruiz created a washed-out chrome manicure using a custom blend of Silver Chrome, Putty, and Ice Blue Shimmer to accessorize glamorous swimwear, silver-heeled shoes, and chunky jewelry. Ladies and Gentlemen, I hope you are ready for a new collection full of neutrals! 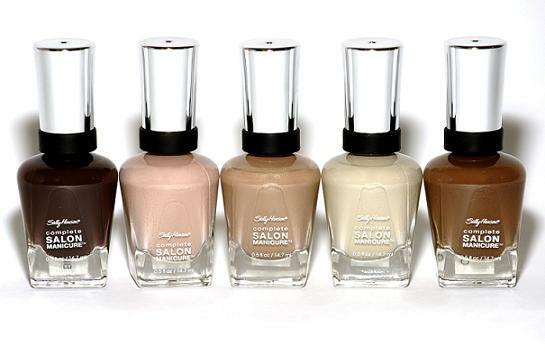 Sally Hansen has again teamed up with Tracy Reese for another collection that is straight from the runways. Upon first glance I was slightly worried about how these would look with my skintone, but I'm happy to report that they all worked just fine! With fall upon us (at least in certain parts of the world...and just parts of the US), these browns are just perfect in my opinion. I also think these work well for those times you want a break from bright colors, or for neutral colors to wear to work. From what I was told, these will be released in September at drugstores, so be on the lookout for these (I personally haven't seen them at Walgreens or CVS yet). Evening Fog is the lightest color of the collection and a light khaki brown creme. Unlike most colors that have been coming out which are more beige and grey, this one sticks with the beige. Every color from the collection only needed 2 coats so they are very pigmented which is great. The brush on these bottles are the large tapered ones, and I know, you've heard me complain about these before. On the first day I was swearing at the brush, after day two I started to get the hang of it, and now *gasp* I actually sort of like it! Those of you with skinny nail beds may still not like the brush. So, what do you think? Are you feeling the neutral trend? Remember when I said I wasn't going to buy any more of the China Glaze Vintage Vixen collection? Oops! When ordering the Orly Cosmic Fx polishes online, I decided to tack on a few polishes to make shipping worthwhile, so I ended up adding a couple more from the Vintage Vixen collection. I haven't swatched the other polish I got from the collection, so this is the only one you'll be seeing for the next week or so (at least). After seeing Hey Doll on other blogs, I wondered why I didn't buy this before. I love pinks and I love shimmers! I know, a blogger that actually likes pinks! *gasp* Hey Doll is a rose/mauve pink metallic shimmer (whew, what a lengthy description, right?). It's finally starting to feel a little bit cooler here in North Carolina, so more muted colors are really calling to me. I really love this one since is is so understated. Also, the application was awesome and only needed 2 coats to cover the nail line. If you haven't checked out the Vintage Vixen polishes, I suggest you do so, especially since the heat is starting to die down. Oh Rampage, you are so saucy. I tried taking a picture indoors, but it is so dark and shiny it makes my camera go crazy so I had to go outdoors (which is usually pretty hard for me since I work all day). Now the outdoor picture has so much glare because of the sun. Sigh. I guess this as good as it gets right now. Anyway, Rampage is an awesome forest green jelly that never appears black, even indoors. I've never tried NARS Zulu, but that is another really popular green jelly (that will make another appearance this fall), and according to other blogs, Rampage is not a dupe for it. I don't care, it's still really cool. Illamasqua is not 3 free, so basically application and drying time are awesome. It needed 2 coats and it was completely opaque. *sigh* I'm watching Hoarders. This show makes me anxious and I know some people can't watch this show. I'm so glad I don't have those tendencies like so many others do. Ok, now that I've depressed everyone, let's feel better by talking about some grade A nail polish. Up tonight is Hard Candy Sweet P which is a pea green glitter suspended in a clear base. The glitter is fairly densely packed, but still needs at least three coats to completely cover the nail. Also, I really slathered on the three coats so this was generously applied. The picture shows a few little bald spots, but honestly, in real life I didn't notice this at all. I also think this would make a nice layering glitter if you don't want to apply so many coats. I received at least three compliments on this polish while I was at Ulta the other day so this one is really popular. I used Sally Hansen Insta-Dri topcoat on this one, but it wasn't thick enough and still felt bumpy. I think if you used a thicker topcoat such as Seche Vite or Poshe you wouldn't have this problem. For a glitter, removal wasn't too bad either (much better than, say OPI Mad as a Hatter). Overall, this is an awesome 70s pea green glitter that really makes a statement.